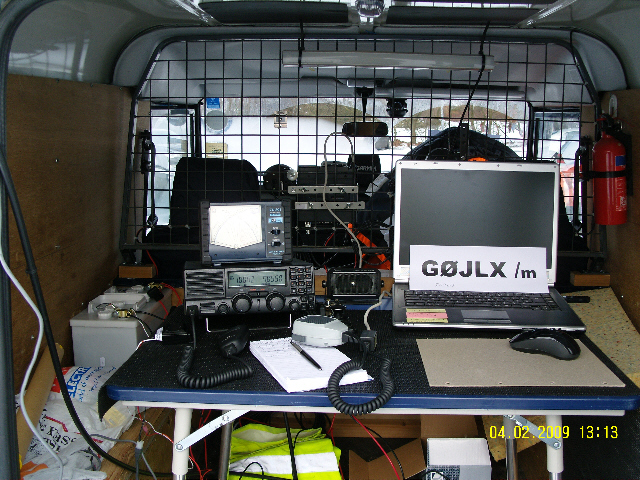 Hi - and welcome to this simple webpage from the shack of Andy, GØJLX, more colloquially known as the 'Jolly Large X-Ray', operational on HF, 6m*, 4m, 2m and 70cm, hi hi. (* I've got a problem with 6m at present). Not perhaps your archetypical Amateur Radio enthusiast, as I am a also a professionally qualified, Chartered Engineer. I specialise in Radio Communications, Radar and Navigational Aids in Air, Land or Sea environments. I've been licenced since 1988 and to be honest, I am still learning all sorts of things about this wonderful hobby of ours and I just love playing about with radios and aerials (or antennas if you prefer) on an experimental basis. I am an active member of RAYNET, the Radio Amateur Emergency Network, and currently belong to both the HF group, the National Group and the NW Hampshire local network. 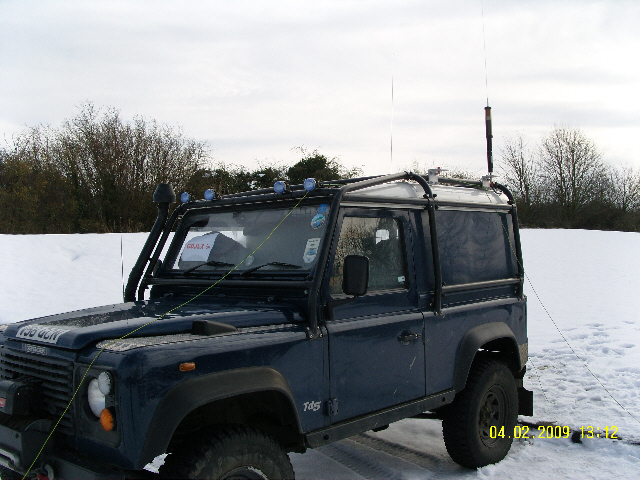 The Land Rover plays an important part in providing us with a full off-road facility if we ever need it, and can be quickly rigged with HF, VHF and UHF to act as a mobile relay if required. On a historical note, I started off with a borrowed Yaesu FT-101 HF rig from the Southampton Amateur Radio Club and made a very simple home-brew multi-band trap dipole which, when strung down our 120 foot long garden of the time, worked fairly well on three of my favorite bands, 15m, 20m and 40m. I also slung up a quarter-wave zepp between a couple of trees with a half-decent counterpoise for 80m and top band that worked quite well on 80m, but not so well on 160m. My main mode and interest when first licenced was CW and I was lucky enough to have been bought a really good pump-action straight brass key by my Dad (who was apparently a class one military telegraphist in the 1939-45 war) from the Kent stable. I still have that key and it is still my pride and joy to show it off as "the station key". Needless to say I had great fun making the key up from the kit too ! Unfortunately, 25 words a minute in professional commercial maritime CW training caused the dreaded 'glass wrist' problems and I decided that if I was to continue with CW, I should seriously look at something other than just straight keys. And I suppose that was the start of my very modest collection - which is still growing - albeit somewhat slowly........ I also have a delightful high speed paddle key which is a joy to use, (see some of the pictures below). I am a long-standing member of the FISTS CW club (member #358) and I am a member of RAFARS, the Royal Air Force Amateur Radio Society (member #2701). These days, the FT-101 is long gone back to its owners, and I run an FT-897 for the most part (more of that below) and an older FT-102 which is also a lovely rig for backup HF use. I also have a Philips 4m FM rig which I dust off occasionally and activate, a Motorola CM360 for 4m use, an FT-857 for portable and mobile use, a couple of dual band Icom IC-2725e for 2m and 70cm FM mobile use and a couple of handhelds for 2m and 70cm FM as well. My main interest these days is HF CW and SSB, although I do still thoroughly enjoy operating on the 4m, 2m and 70cm bands, hence the other rigs which I have enjoyed for many a year. If you catch me about mobile, I will most likely be operating the ICOM 2725e as this is a nice little dual bander that works well in the car or the Landy, or possibly on the FT-857. 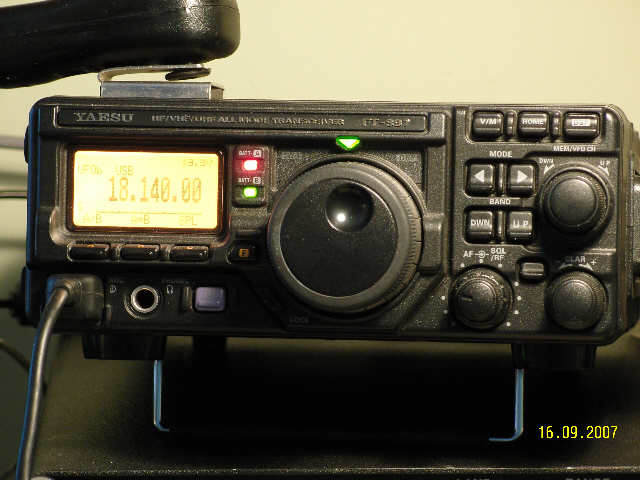 I also own an FT-897 (see pictures), which is a fantastic portable rig, that has been halfway around the globe with me on several expeditions under different callsigns. I now use it mostly when I go /portable to hilltops and the like and operate either from the car or the Landy or even under canvass with the generator ! I've put the batteries in it and have run with the 20W RF output they convince the rig to produce to some interesting effect with the doublet, such as when on hilltops without any other power. Maybe I should invest in a couple of solar cells ? I've experimented with all sorts of different aerials and still like to use the good old doublet at 30-odd feet in an inverted vee configuration with a length of 450-ohm balanced feeder off an ATU, or perhaps an 82'-long "Bandspringer" sloper antenna with another 82 feet of copper run out at ground level as a counterpoise. The top end of the Bandspringer antenna is at about 18 feet if I've taken the portable mast out with me. Either configuration can be used out of the Landy, or from a backpack. I've got all sorts of aerials (antennas) at home, mostly home brew wire or purchased alloy multiband verticals that I've experimented with from time to time over the years. I must say, the old favorites like the G5RV and the doublet do seem to work exceptionally well under most conditions and in a huge multiplicity of configurations. I've also played about with a wire 80m monoband dipole at a couple of JOTA's in the past and have plans for a "ship-like" T against ground. Home these days is up a 400' hill just north of Winchester, and I am still trying to get everything sorted out after so many years of it all being in boxes. If you are interested in seeing a few of the shack construction pictures, follow this link to my 'construction' page ! If local operating conditions permit, I run a VL-1000 linear that allows me to run legal limit on HF, but it is rarely bought into action - except perhaps for JOTA or when I want to really be heard on the bands ! I also teach amateur radio at all 3 UK levels - Foundation, Intermediate and Full and have full access to a registered UK exam centre, for all three licence levels. Click here for details !! Please contact me by email if you want more information on Amateur Radio in general, or want to book a place on a course (which are generally held on Saturday afternoons). There's plenty of free car parking at the venue and no age limits ! All are welcomed. I am fairly readily contactable by email - GØJLX at mail dot com will generally find me, providing the server is up and running properly. Might take a day or three for me to respond, but you will eventually get a reply ! Just in case that server fails, you can always try andy_digby at hotmail dot com direct. 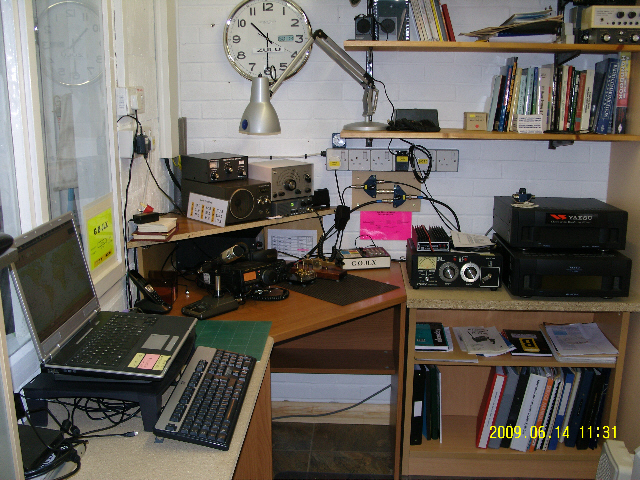 HF: Here's a picture or two of the HF station as set up at a typical /m location ! 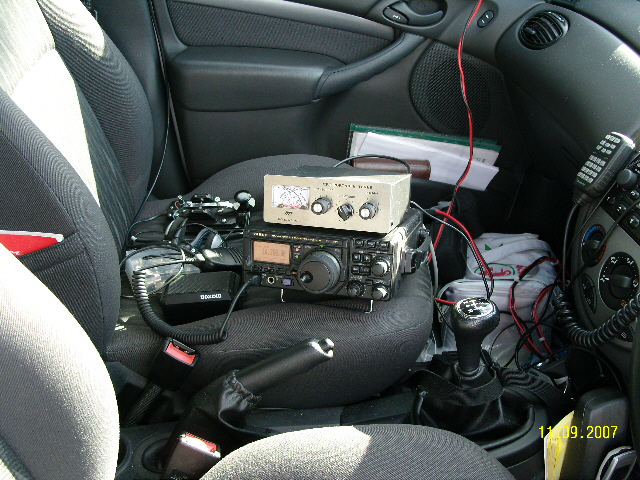 An FT 897 running about 100 watts on a good day, either SSB or CW via an MFJ-971 Portable Antenna Tuning Unit (ATU). 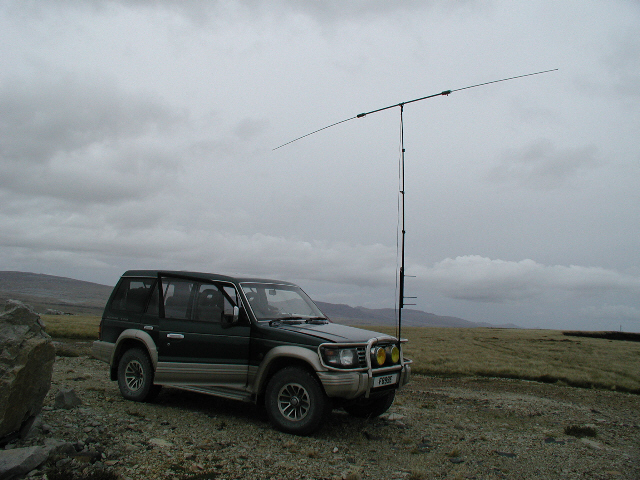 Other mobile options include the wonderful "Buddipole" portable antenna that I took down to the Falklands with me (click here to see my VP8DJO website), which enabled me to work back to the UK from a hilltop location operating /m. The Buddipole has also been out to Ascension Island with me when I was operating from there. (click here to visit my ZD8AD website). 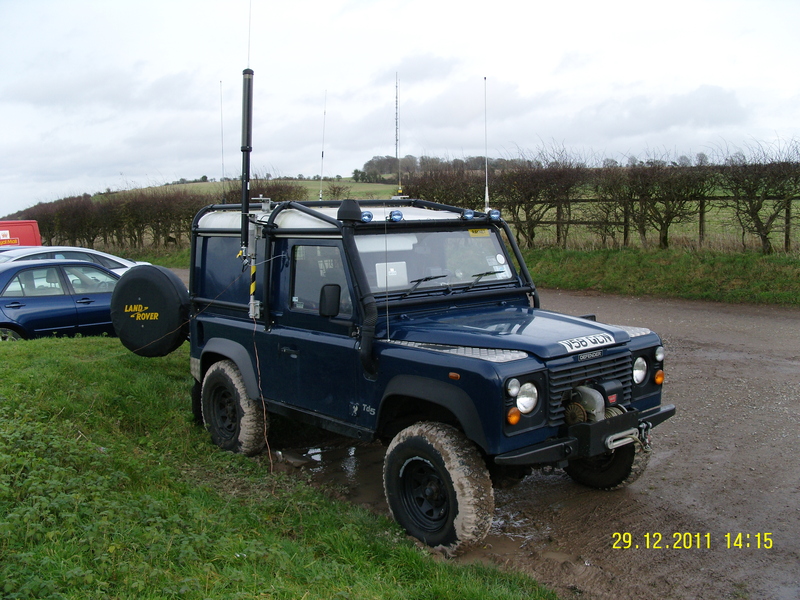 Other mobile operations these days include the landrover and a 'Taheel' tunable mobile antenna that responds particularly well to four 35' long ground radials run out - as you can see from the next series of pictures taken earlier in 2009. 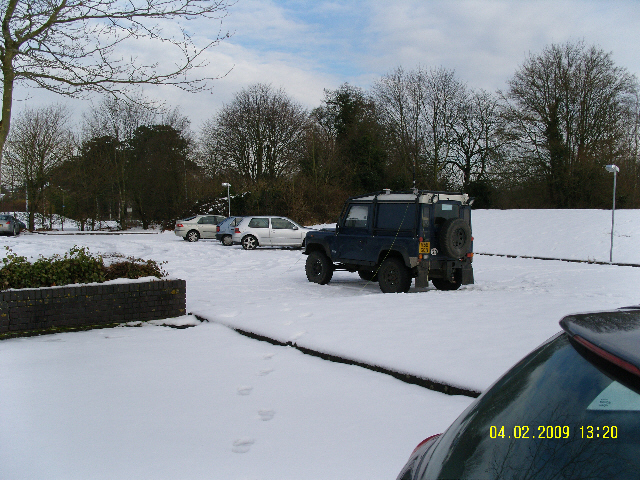 Just for fun, I have now included a webcam page which is intended to carry live webcam piccies of the station I am operating when I am out in the field somewhere, typically operating out of the back of a landrover and / or on a hilltop somewhere !! (click here to visit my webcam page). You might like to visit my JOTA and JOTI websites and have a look at the station with its antennas rigged as at last October (and work, weather & health permitting, again this October). GBØBWS is the normal special events call for the Bishop's Waltham Scout Station. As always we are planning to be active throughout the third FULL weekend in October with this special events callsign. You might also like to visit my Twyford Waterworks Trust website and have a look at the station we rigged in August. GBØTWT is the special events call for the Twyford WaterWorks Trust Station. We are usually only active with this callsign once or twice a year (for the Open Day and for International Pumping Stations On The Air day for example). The pumping station is located in such a position as to preclude all but HF ops for the most part, although we do offer a 2m talk-in monitoring facility for visitors. 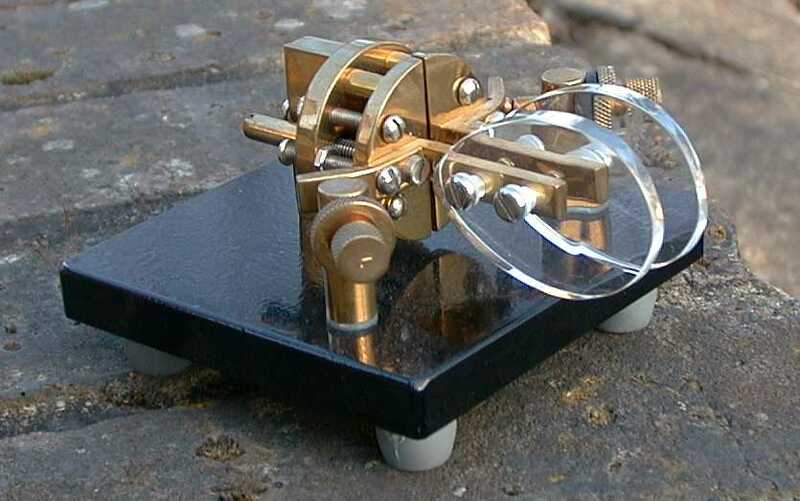 The UK FISTS CW club is the place for lovers of Morse Code if you are within the EU !! There is also a USA chapter of FISTS if you are visiting my site from the USA.